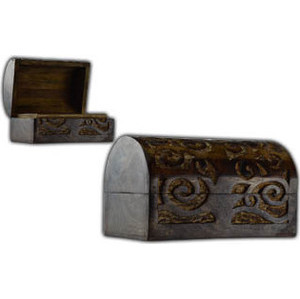 Shop > Magical and Wiccan Crafts > Boxes, Chests and Cupboards > Tree of Lifetreasure Chest 7"
A wonderful, round topped, wooden box featuring a stylized Tree of Life carving covering the front and wrapping up over the top of the hinged lid. 7" x 5" x 4 1/2" inside is 6" x 3 3/4" x 2". The recess in the lid bows up to a 2" depth at the deepest portion.